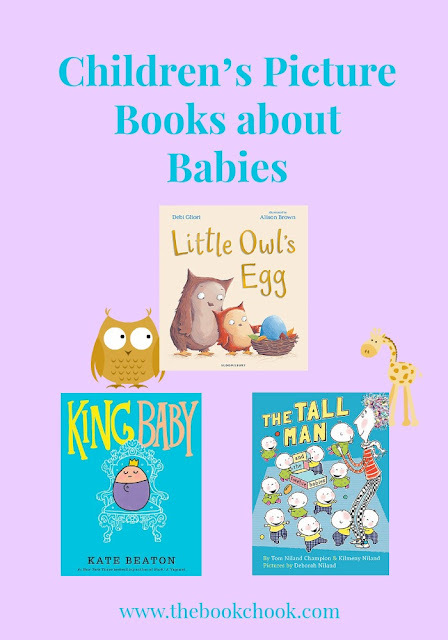 Here are three recently published children’s picture books ABOUT babies. Below the reviews, there’s a list that will take you through to lots of other books I’ve reviewed with a baby theme. NB These three are not books specifically written FOR babies, but all would make great gifts for any young child! From a much-loved family team, this hilarious story is a riotous triumph of problem-solving. All the boys were called Alistair. All the girls were called Charlene. One day the door slams shut ... with the Charlenes on one side and the Alistairs on the other. What will the tall man do? This zany children’s picture book was published in 2010 and was runner-up in the CBCA Book of the Year, Early Childhood in 2011. I think of it as a classic Australian children’s picture book, and hope it will continue to be published for many years to come. There is something very dead-pan about the humour - 6 baby boys called Alistair, and 6 baby girls called Charlene. A very tall, slender man with multi-coloured hair who cares for and about the babies, but when their naughtiness exasperates him, he scoops up all the girls and goes outside where the door slams shut! And then, he tries to crawl back inside through the cat flap but gets stuck there. Even quite young kids will laugh over these antics, especially when the 6 boy babies and the 6 girl babies try to pull the tall man out at the same time! The illustrations really do add to the hilarity. They feature bright colours and patterns, and all the characters have wonderful facial expressions. I'm your baby owl. You don't need a new one. Little Owl isn't pleased to hear that there's a baby owl in the egg Mummy has laid. So Mummy pretends it might be a baby penguin ... or crocodile ... or elephant. In the fun of imagining different kinds of siblings, Little Owl realises that a baby owl might just be the best thing of all. The advent of a new sibling has a profound effect on a child. I can still remember the day my baby brother came home from the hospital. Luckily, I assumed he was a new toy for me to play with, but like lots of kids, Little Owl has grave doubts. Mummy Owl, with the wisdom mothers are famed for, suggests all sorts of alternatives to a baby owl. Somehow they all seem either yucky, downright scary, or way over the top, and Little Owl works out for himself a satisfying conclusion. I like the way Gliori has Little Owl work through his problem, and leaves young readers to make the realisation for themselves that mothers love all their kids. Brown’s illustrations are loads of fun. There’s a great cutaway of a worm’s home, the expressions on the characters’ faces are priceless, and the imagined scenarios about various babies that might be inside the egg will make kids laugh out loud. King Baby is a children’s picture book by Kate Beaton, published by Walker Books Australia (2016.) RRP: $Au 16.99. I have previously reviewed Beaton’s The Princess and the Pony. If you thought there could be no character cuter than The Princess and the Pony's roly-poly pony, think again! Meet egg-shaped, take-no-nonsense King Baby, whose imperious words will incite many a giggle. The perfect title for wobblers graduating to toddlers, expanding and expecting families, new parents, children about to become new siblings, older siblings ... and all fans of funny picture books! With her trademark deadpan, intelligent and completely original humour, this is another Kate Beaton title that will have both children and their parents laughing at the same time. King Baby is the archetypal despot. We first meet him on the front cover where he sits on a throne, looking smug. Soon people come to greet him and he bestows smiles on them, generous in his blessings to all. He gives them kisses, gurgles and coos. Until he is tired, when the benevolent despot is transformed into a demanding and irritable one who needs to be fed, burped and changed. Parents everywhere will nod ruefully over the double-page spread showing exhausted parents and baby gear strewn about. King Baby gives his minions (parents) commands - “ehhbpp” - but they fail to understand and frantically bring him anything but what he wants: his toy ducky. Aside from being a picture book any parents will relate to, I think children will enjoy King Baby too. They’ll giggle over the dichotomy between the baby’s thoughts - “These subjects are fools!” and the baby talk that comes from his mouth. They’ll love the egg-shaped baby and his tyranny. And they’ll truly appreciate the twist in the ending. King Baby makes a great addition to any picture book collection. It also has value as a gift for parents-to-be. I would accompany it with some nicely printed cards that offer to baby-sit and give new parents a much-need break from their future royal offspring! I’ll be adding these three wonderful children’s picture books to my themed list, Children's Picture Books about Babies, embedded below. Find other Children's Book Reviews on The Book Chook by clicking Reviews in the right sidebar.